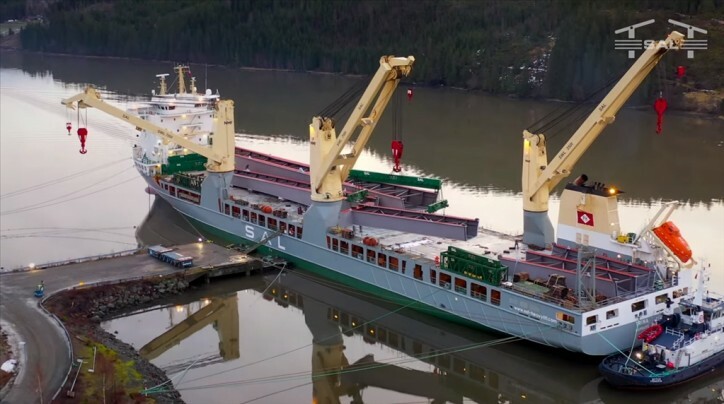 SAL Heavy Lift (SAL) delivers 12 bridge sections for the Beitstadsundbrua bridge from China to Norway. The final bridge is part of the largest road construction project in northern Trøndelag, will measure 580 m in length and will connect the municipalities of Steinkjer and Malm, crossing the Beitstadfjorden. The bridge will make travelling between northern parts of Trøndelag county considerably safer, as well as reduce travelling time significantly. «The new County Road (FV 17 and 720) including Beitstadsundet Bridge, will eliminate the distance challenges the region has. The new road and bridge significant increases the municipality of Verran’s opportunities to further develop existing industries and attract new industry. The municipality is now, due to the new road and bridge, in dialogue with industrial companies exploiting establishment of industry in Verran”, states Jacob Almlid, Special Advisor Industry & Commerce at Verran Kommune. “It only took us 35 days to directly sail to Malm from Nantong in China,” Sune Thorleifsson, Head of Projects at SAL explains, “despite the unique conditions in the port of Malm, with an only 20 m wide jetty and 2 m tidal range, it took just 6 days until we were able to successfully and smoothly deliver 20.668 cbm of cargo to our client.” Due to local port regulations all twelve bridge sections were directly discharged onto SPMT’s, 25 m away from alongside the vessel. A tailormade mooring arrangement contributed to the success of the discharging operations.